Some moderate Republicans aren't OK with revisions to the Senate's health care bill because of prospective cuts to Medicaid. The Senate's revised health care bill reportedly isn't gaining enough traction within the Republican party. Many moderate Republicans aren't on board with the revisions because of the prospective cuts being made to Medicaid — no different from the version of the bill put out in June. Those cuts are still projected to be almost $800 billion over the next 10 years. But other parts of the bill were a sticking point, too. Texas Sen. Ted Cruz, who originally didn't support the bill, added an amendment that would let insurance companies sell cheaper plans that don't meet Obamacare requirements, as long as they offer a plan that does. This means healthy individuals wouldn't have to buy Obamacare plans, sending costs upward for people with pre-existing conditions who can't afford other plans. And while the revised bill's biggest sell might be the $45 billion that would go toward substance abuse treatment, some experts believe the massive cuts to Medicaid would close off other programs that treat drug addiction. Republican Sens. Rand Paul, Susan Collins and John McCain have all signaled opposition to the bill's revision. 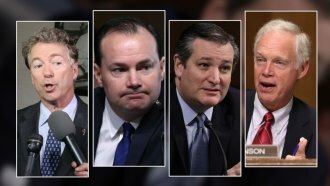 Several more GOP senators appeared to be on the fence. Still, President Donald Trump seems eager to sign any bill that lands on his desk to repeal and replace Obamacare. He tweeted: "Republicans Senators are working hard to get their failed ObamaCare replacement approved" and "After all of these years of suffering thru ObamaCare, Republican Senators must come through as they have promised!" The bill needs at least 50 votes and a vice presidential tie breaker to pass. But even if it does, it would face another hurdle. The House passed its own repeal-and-replace health care bill back in May. If it fails to pass a Senate version of the bill, both chambers would have to work out a compromise.